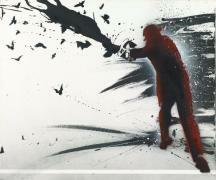 Born in Bristol in 1969, Nick Walker is an established graffiti artist. He is credited with being part of the Stencil Graffiti movement that Robert Del Naja of the Bristol trip/hop group Massive Attack, started in the 1980s, which was a major influence on Banksy (Or are Robert de Naja and Banksy one and the same?). Walker was commissioned by film director Stanley Kubrick to recreate the graffiti on the streets of New York for his film Eyes Wide Shut, starring Tom Cruise. Walker was a main participant in the 2011 ‘See No Evil’ event in Bristol, where he painted “perhaps the most striking piece at the event”, one of his bowler-hatted gentleman (a ubiquitous theme by Walker) on the side of a tower block in Nelson Street. His bowler hatted ‘vandal’ was even featured in a video by the Black Eyed Peas. Nick Walker was the first artist-in-residence of the Quin Arts programme at the Quin hotel in New York City. He created 15 original pieces on-site for the Quin’s permanent collection during his residency in 2013. In 2016, Walker revisited the Quin to showcase both historic images, as well as a new work. This solo exhibition, curated by DK Johnston, presented 25 original works and opened the hotel’s arts programme for 2016.